Art's-Way : Agricultural mill mixing machinery. 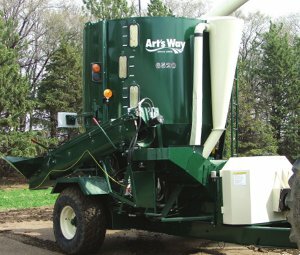 When looking for a quality and consistent ration mix with the luxury of both portability and flexibility, look to the leader... look to Art's-Way. The 6520 Portable Mixer offers the largest, most innovative and productive grinder mixer on the market today. 4 way reversible hardened knives and 780 sq. inch grinding area. 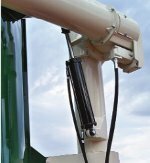 This grinder mixer can be tailored to your specific livestock operation. The fully self contained hydraulic system is operated by a wireless remote control for full functionality of the grinder mixer to include, raise/lower and swing of discharge auger, open/close of tank discharge gate and start and stop operation of the unload system. The newly designed 10inch discharge auger features hydraulic orbit motor operation and decreases unload time by 50%. The time tested mixing auger and tube design provides thorough mixing of ingredients for superior mix uniformity. Stop... Compare and then look to the leader... look to Art's-Way. 26 inch - One piece hammermill design with 96, 4-way reversible knives offers a more consistent grind for better feed rations. Grinding capacity up to 42 bu. of shelled corn per minute. HP requirement 80 to 160 h.p. Approx. Weight with Auger Feeder (2041kgs.) 4500 lbs. Photographs on this page that we have taken, or those that Art's-Way have published, may be displayed with safety shields and/or guards removed to show particular mechanical functions.